Perfect for active people who need a reliable, shock- and water-resistant phone with a simple menu. Its resistance to dust and water is confirmed by the IP67 certificate. 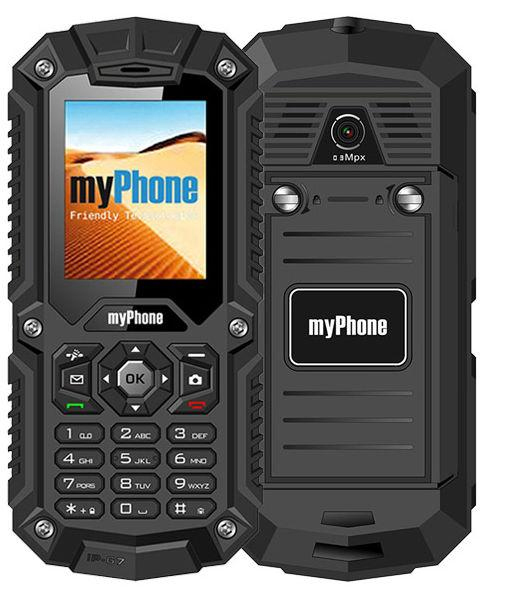 The ideal solution for people who need a durable phone that’s resistant to extreme weather conditions. The IP67 certificate confirms the phone’s complete protection against contact with dust and resistance to immersion in liquids up to 1 m for 30 minutes. The battery capacity of 1700 mAh provides a long operating time without the need to recharge, making the phone the perfect travelling companion! It is possible to use two SIM cards in one device. With a capacity of 1700 mAh the battery provides a long operating time without the need to recharge – up to 15 days standby time. Option to plug in an external microSD memory card up to 16 GB. FM radio, Bluetooth, GPRS internet, clock, alarm, and calendar. A dedicated battery allows for a long operating time without recharging. The built-in 0.3-megapixel camera allows you to save photos to the phone. Turned on/off using a side slider key. Lihtsus ja praktilisus ruudus !